From the Beginning of 2017 till now, Natural Gas (NG) has fallen sharply. In Jan 2017, Prices were at 4.000 – now it’s trading at 2.500! A deep sell off that wiped almost 30% of earlier gains. Currently the Price action is hovering around important support level 2.500. Reaction of buying and selling pressure from this decision point can determine the future market sentiment and direction. In December 2016, NG tested the resistance level at 4.000, but couldn’t sustain above it. The movement resulted in false break at the High. As a result, prices fell sharply leading a change in market sentiment and Psychological tone of Investors. Pessimistic attitude further gained force, when CT setup appeared at 3.500 and Market successfully broke the key support level at 3.000 in a continuation. 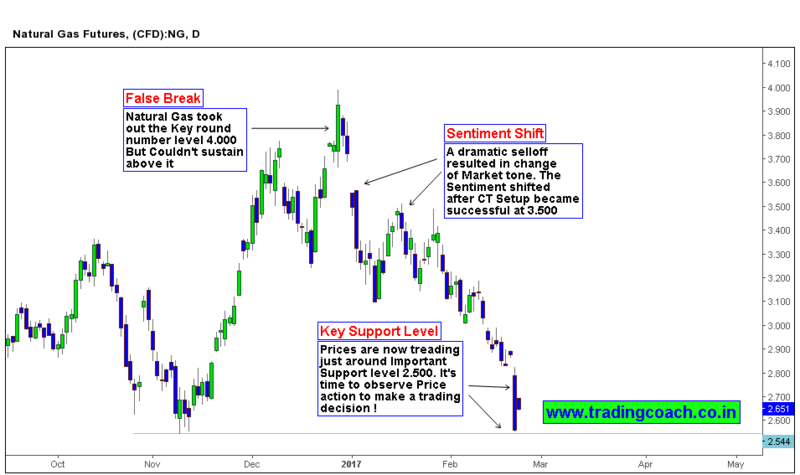 To decide whether the bearish momentum sustains or not, we need to watch the Price action at Key level 2.500. There are possibilities of a slight retracement and pullbacks, if the bearish momentum is about to continue. If we see a strong rebound to upside, then we have to wait for further clarity before taking a decision. Crude oil – What price action tells us ?